I wasn’t entirely thrilled with the first book in this series (see review here), finding it to be tremendously average. But when most of a book is centered around union rabble-rousing, it’s challenging to develop an interesting sci-fi story. But it wasn’t worth abandoning entirely and so I went in to this, the second book in the series, trying to keep an open mind. I liked this book much more. Padma Mehta was once a union labor organizer but then bought the Windswept distillery and was hoping to retire comfortably with some really top-notch Windswept rum. But her enemy, Evanrute Saarien, who had been in jail for crimes committed at Windswept, is stirring up the pot again, trying to tell anyone who will listen to him that they should go out on strike. And the people ARE listening to him. Padma is yanked out of her retirement dreams by the current union president who has proven to be ineffective in controlling the union members. Padma is coerced more than encouraged to fight for the union once again, but Saarien’s damage isn’t just contained to the distillery workers – it’s a planet-wide strike. This book is a thrill-a-minute train ride with plenty of action. As different groups get in to the striking fray, we have a build up of more and more violence and potential violence. Padma doesn’t trust either Saarien or president Letty but she can see that she needs to choose a side in order to get her distillery operating again. Author Adam Rakunas does a nice job of portraying Padma as the reluctant hero. We see her tortured decisions and her reticence to get involved. But at the same time, she is driven and committed once she makes a choice and we see why she was successful when she worked for the union and why she’s successful as a distillery owner. The secondary characters are not quite as clearly defined. Letty and Saarien are essentially the same character but on opposite sides of an issue (I know … that’s sort of the point) and there isn’t much to make them stand out. I might have once said that the plot is hard to believe – a planet-wide strike! – but as I write this it is voting day in the United States and I’ve seen a lot of polarizing political behavior and suddenly the idea of behavior on such a scale seems much more possible (it helps that this planet is not quite the same in size as our Earth). Overall, I had more fun and was sucked into the story a little more although I would have liked a little more depth to some of the secondary characters. Looking for a good book? 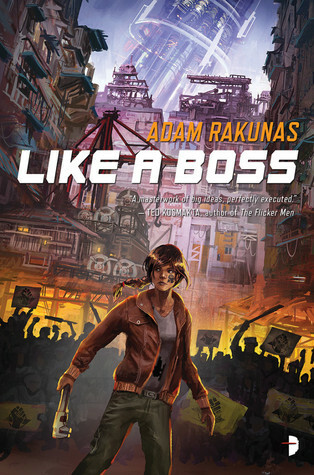 Like a Boss by Adam Rakunas takes us back into the Windswept series with plenty of action in a political sci-fi adventure.